The United States Postal Service (USPS) is fixture of American life with its roots going back to colonial times. It operates the largest civilian vehicle fleet in the world, delivering about half a billion pieces of mail a day. As with any system of that size it’s always interesting to peek and poke at to see how it works. Unfortunately, it’s not as fun to hack as the phone system once was, but that didn’t stop some hackers pranksters from giving it a go. So how do you “hack” the mail? 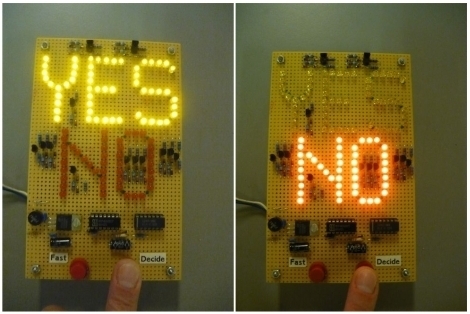 Simple, by testing its own rules. The folks at [Improbable Research] did just that and some of the results were interesting enough that we thought we would share them with you. They started with testing valuable items to see how honest USPS employees would be. First they attached a $20 bill to a post card. Yep, it showed up just 4 days later, and the money was still there. So they decided to see if sentimental items, that normally would be refused by the postal service, might skate through. They were able to send both an un-boxed single rose, and a human tooth (in a clear plastic box) without issue. Both arrived just fine, despite the rule that human remains are not allowed to be shipped via USPS. We’ll let you read some of the other items they tried. So the next time you’re in Hawaii, forget about sending that generic, boring post card back home. Instead, slap some stamps on a coconut to let your friends know exactly how much fun you’re having. With that said, we wouldn’t be doing our job looking out for our readers if we didn’t mention that before you try anything too outlandish, you can be fined for abuse of the postal system, even as a recipient. There was a fair amount of fallout when those guys sent a camera through the mail. Have fun, but not at someone else’s expense. 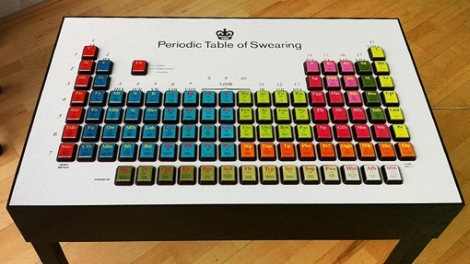 If you often find yourself at a loss for words in the heat of an argument, perhaps this Periodic Table of Swearing is something you might be interested in. Built as a marketing tool for the British comic “Modern Toss”, the table features over 100 fruit machine (slot machine) buttons, each of which triggers an audio clip of the cheeky word or phrase listed. The buttons were mounted on a piece of laser-cut MDF which makes up the table’s surface, while all of the wiring and the guts of the machine are neatly tucked away underneath. Clay, the company that actually built the table, doesn’t elaborate a whole heck of a lot on the details other than stating that it includes over 100 meters of wiring, 300 solder joints, and a whole lot of swearing. We imagine it could likely be replicated with a small micro, an SD card reader, and a couple of speakers – for anyone interested in having one of their own. While it’s not a hack in the strictest sense, we’re sure it’s a great conversation starter ender, and we did get a chuckle out of the demo video below (Warning: Language). The crew over at the HarfordHackerspace used their wits and creativity to land a spot at the final round of Red Bull’s Creation challenge. The team arrived in Brooklyn just yesterday, ready to take on all comers in the 72-hour hacking challenge which kicked off earlier this morning. Like any other hacker convention, the Red Bull challenge sports its own unique guest badges just begging to be poked, prodded, and otherwise fooled with. Once the team arrived in New York they were given theirs, and after the opening festivities came to a close, the hacking began. 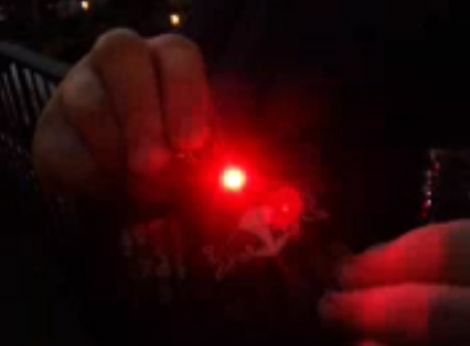 The badges were putting out what looked like Morse code messages via a single red LED, and while part of the team worked to record and decode the message, others started reverse engineering the badge’s on-board PIC. They were successfully able to bypass the PIC’s fuses to read the code inside, and what they found was pretty funny. You will have to follow the link above to find out what it was, but rest assured, the Red Bull folks definitely have a decent sense of humor. The Will It Blend? host, [Tom Dickson], is at it again. This time, he blends the new Apple iPhone 3G. We’re completely in awe of how efficient the blender is at the destruction of electronics, and this time, it’s no different. Watch in fascination (or horror) as [Dickson] turns the latest iPhone into ashes.